The West Point Story should have been shot in color, is all I can think when I watch it. Somehow the black and white photography detracts from the energy of the picture. From the opening sequence, filmed at the West Point Academy (still going strong) with the cadets singing and marching around the campus, one thinks how much better it would have looked in color. 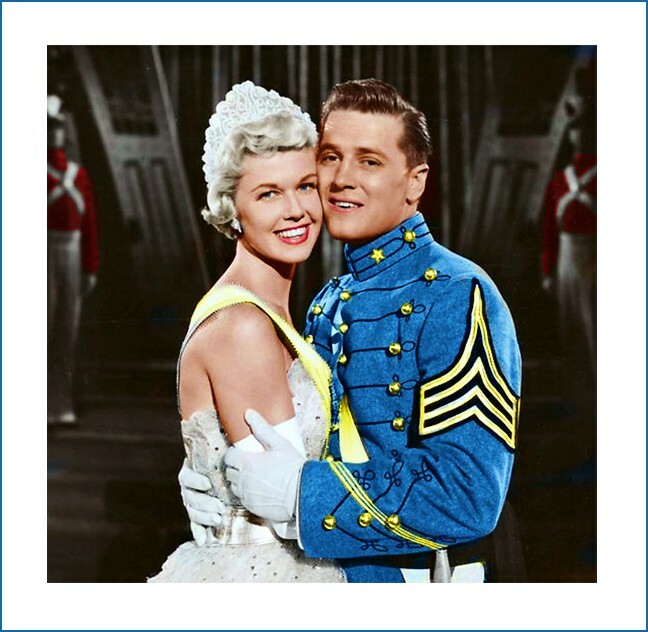 The third of three Doris Day films released by Warner Brothers in 1950, The West Point Story provided an opportunity for her to be featured with two of the studio’s most popular stars, Virginia Mayo and James Cagney. 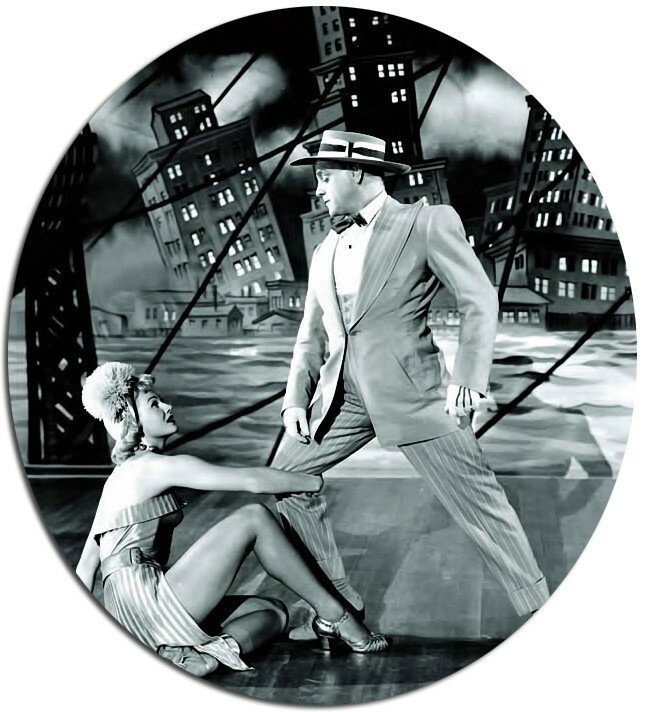 It was Cagney’s first musical since winning his Academy Award in 1942 for Yankee Doodle Dandy, and it also reunited him with Virgina Mayo, with whom he had shared the screen in the scorching melodrama White Heat. 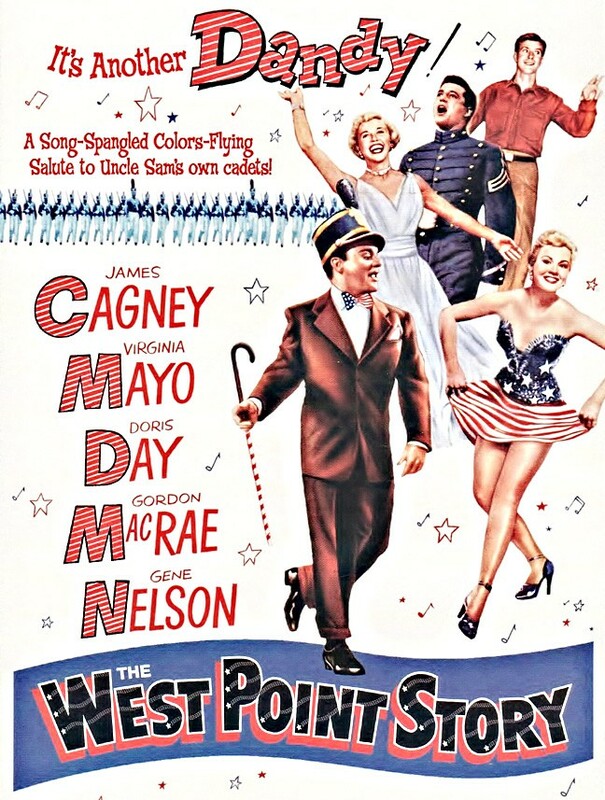 Cagney and Mayo go to West Point and stage a show that somehow resembles a Hollywood musical. There is a feud between Eberhart and Bix that stems from a previous tug-of-war over a young singer, Jan Wilson (Day). She had been buried in the chorus of an Eberhart show, and Bix secretly helped her get a Hollywood contract when he felt she was being misused. This caused Eberhart to fire Bix and get him blackballed on Broadway, leading to his current sad state of affairs. Afraid that Eve will leave him if he refuses to accept Eberhart’s offer, Bix reluctantly goes with her to West Point. 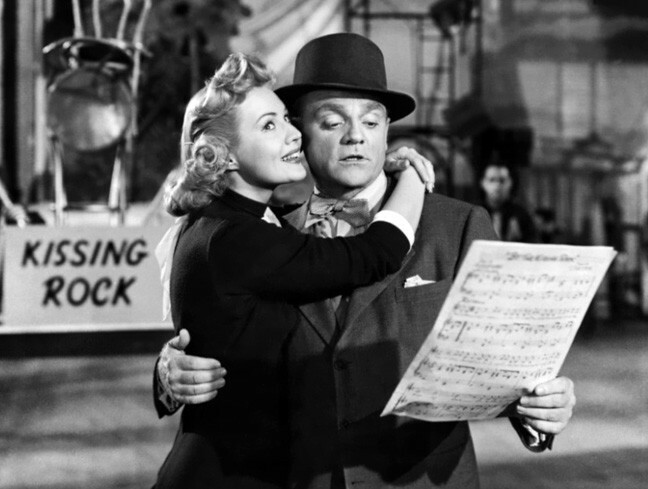 Virginia Mayo and James Cagney work hard to keep the audience entertained in The West Point Story. The rules and regulations at the Academy are a hindrance to Bix. Having earned a formidable reputation as a hellion during his former military service, now he is causing havoc once again. After striking a cadet, he is first barred from West Point and then gets a second chance to return to the campus – as a cadet himself. He agrees, and the rehearsals resume. 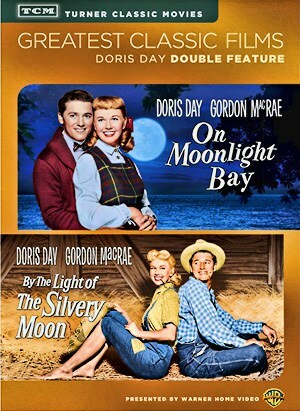 We are treated to Doris Day and Gordon MacRae’s wonderful singing and Gene Nelson’s dynamite dancing. Mayo sings and dances, too, but just intermittently. Bix’s attempts to lure Tom away from the Academy for a career on the stage fall on deaf ears, because Cadet Fletcher is determined to stay in the military after his graduation from West Point. Bix is no quitter, though, and decides to change his strategy by asking Jan to be Tom’s date at an upcoming party. Jan agrees because she owes Bix; without him, she’d still be dancing in the chorus of Eberhart’s show. We are treated to Doris Day and Gordon MacRae’s wonderful singing. This poignant dialogue could have been taken from Day’s own bio, and it is some of her best acting. Tom, deeply in love with her, goes AWOL to be with her. 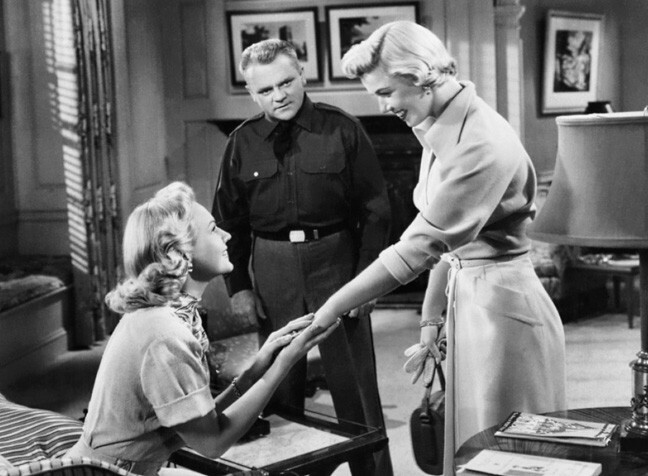 Virginia Mayo greets Doris Day while James Cagney looks on in The West Point Story. This is a very entertaining picture and the production is first rate. It includes some fine songs by Jule Styne and Sammy Cahn, one of which is a clever ditty sung by Day called 10,432 Sheep. Ray Heindorf’s musical direction brought him an Academy Award nomination. Director Roy Del Ruth must be commended for keeping the believability alive, even though much of the script is improbable. Cagney, the centerpiece of the film, is superb as Bix. Although the movie runs almost 45 minutes before Day makes her first appearance, she is given the opportunity to shine and her star quality is evident in every scene she plays. The West Point Story was an indicator of greater things to come: Five years later, Day and Cagney appeared together again, this time at MGM in the superb Love Me or Leave Me. 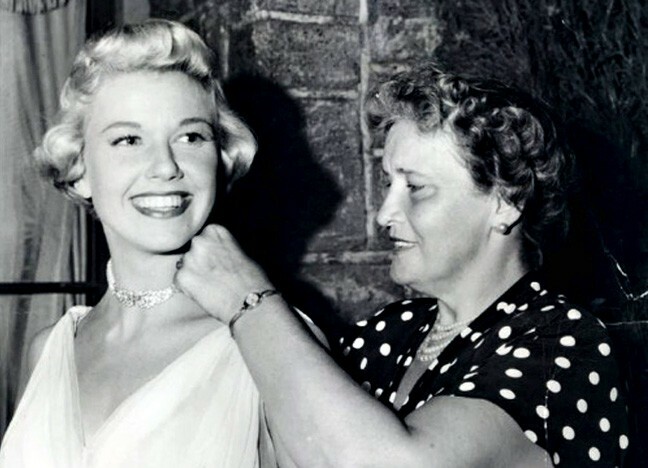 Doris Day’s mother Alma helps out on the set of The West Point Story. 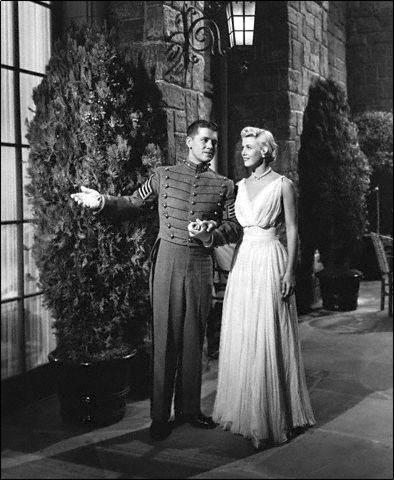 Gordon MacRae and Doris Day. The film was nominated for an Academy Award for Best Scoring of a Motion Picture.